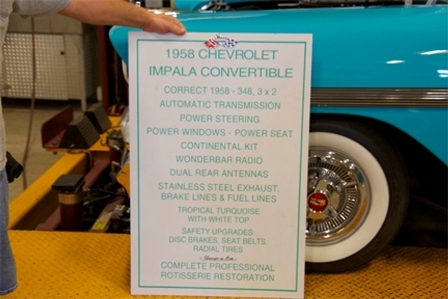 There are also more articles, stories and photos in the Members Only area on the club blog at blog.chevyclub.com . I purchased this '92 Tracker from Biggers Chevrolet used, with 22,000 miles on it in November, '93. Eight years and 154,000 miles later, it's still going strong. I had the clutch overhauled at 153K. I replaced the valve cover gasket 10K or so miles ago. The brakes have been done three times, exhaust twice, its on its third battery, third set of tires and third windshield. I consider this quite routine maintenance. I added a removable hard top. It's had some body work as the result of minor accidents. It has a slight oil leak (one quart per 2500 miles or so). No other repairs have been necessary. I feel like I've gotten two (consecutive) cars for the price of one! And it shows no sign of letting up. I change both the oil and oil filter every 2000 to 2800 miles. It gets a minimum three minute warm-up every morning (start the car, retrieve the coffee cup, rinse it, fill it, feed the dog, grab the paper, then drive). It's kept well tuned. Spark plugs are changed semi-annually. A quart of Slick-50 goes in the crankcase each fall. As you can see, the rust proofing that Biggers did has proven to be an excellent investment. I converted my 1990 Tracker to a pick-up. Here is how I did it thru pictures. The original 1990 Geo Tracker had a black convertible soft-top. Picture #1 shows the base construction for the rear window. I made the base from wolmanized lumber and used brackets to hold the framing inside the rear of the roll bar. There is an indentation that accommodates the base structure. There is also a small lip, on the roll bar, that is exposed when you remove the weather stripping. This is the base frame that is then covered with 3/4 inch plywood. It is cut even with the lip of the roll bar. That finished frame (after painting) was covered with a one inch heater hose that is cut length wise and fitted over the frame and lip to prevent leaks. I used the heater hose because it is durable and can be formed to the curve of the top. Picture #2 shows the base construction of the deck lid that was made from 3/4 inch plywood. The rear window has not yet been covered with 3/4 inch plywood. In picture #3 you will notice the wolmanized base, under the plywood, is protruding 1/4 inch giving me a lip to insert the rear window. The rear window (temporary) is made out of 1/4 inch Plexiglas. This picture is shown with the plywood now trimmed and covered with fiberglass. It is ready to be painted. The inside of the window frame is covered with gray vinyl to match the interior. Picture #4 shows the finished product. I used the paint code of the vehicle to match. 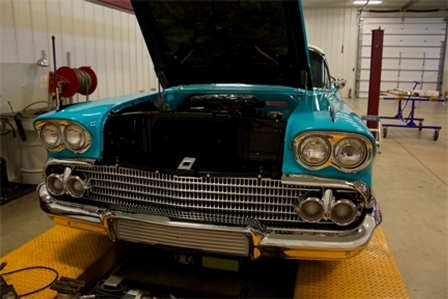 Picture #5 also shows the finished product with vent visors and wheel well covers. 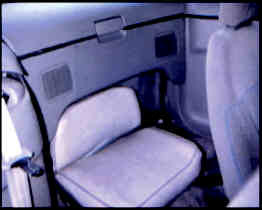 The back seats and seat belt restraints have been removed to accommodate the lid and add more space. 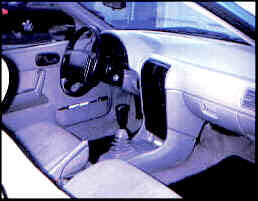 When the deck lid is up and the rear door is open, the entire interior is open all the way to the dash. Well, there it is. I hope you think it is interesting enough for others to want to see it. It does attract attention. I have people ask me all the time if they can see inside, or touch it, or how did I do it. If you have any questions, you can contact me via email at tooz1@aol.com. 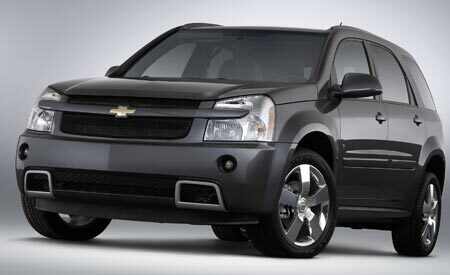 By the way it also gets better gas mileage, far less wind noise and great driving visibility. 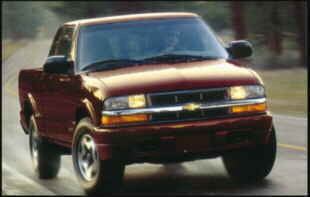 I am a recent member of the Chevy Truck Club having found the club on the Internet. I just want to tell you how glad I am that I joined your club because of the things that have happened since I joined. One of the first things I did was to have my car fixed by one of the recommended repair shops that the club sent me list of. I had thought my car was going to cost thousands of dollars to repair but it turned out I was being told stories by shops that wanted to rip me off. I only need a small repair. I then decided to sell the car though the free classified ad service that the club has. I got the price I wanted and now have bought a new Blazer. Thanks again for the valuable service that you provide. 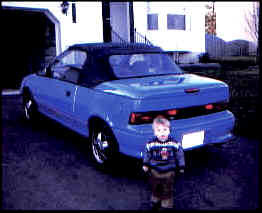 I currently own a 1991 Prizm, blue in color. I have been happy with the maintenance record of the car. The odometer is about to turn over 100,000 miles. I will be putting it into the shop only for minor repairs, i.e. 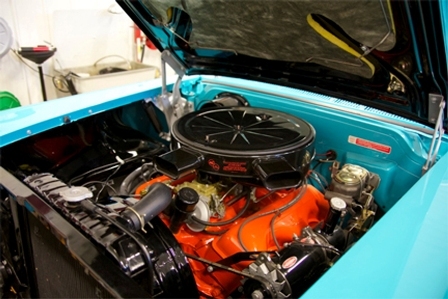 touch-up paint, valve clearances. I am employed by the U. S. Navy and travel a lot between duty station and home. Two others at work have a blue Prizm and we talk with each other in the parking lot on occasion. We all report they are "good cars". My car is unique in that it has been custom fitted with communications gear. This gear facilitates my Amateur Radio and Volunteer Fire Fighting efforts. Yes, there's even a red light on the dash! All windows have been tinted and an alarm system installed. Car jackers can't take the car, even if I give them the key chain deactivator. You must know what the "secret" code combination is. Would-be car jackers could find themselves in the middle of the street with a "dead" car. We used the ignition interrupter instead of the starter disabler. I purchased my Metro on June 19, 1998 with 84,052 miles for $2,800.00. The present mileage is 85,629. The car is air conditioned and it still works perfectly. I have removed all Geo markings on sides and rear. 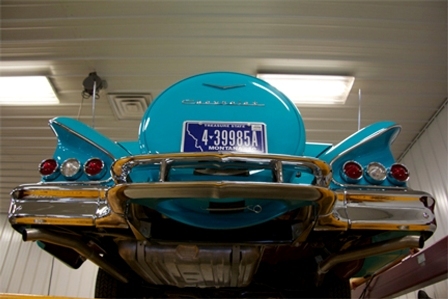 I made a checkered flag out of the front hood name plate and installed tow Corvair 110 trim on each front fender. 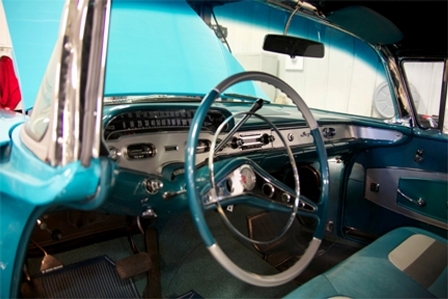 I have also added wood grain trim to the dash, console and shifter and changed hub caps. I am club secretary of the Prairie State Capitol Corvair Club based here in Springfield, Illinois and I am a senior judge at the Illinois Secretary of State Antique Auto Show held each September also here in Springfield. 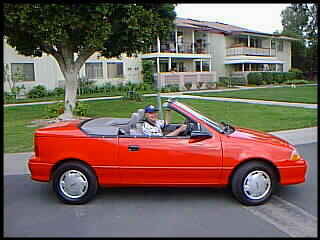 Have been wanting to send you some pix of my '92 Geo Metro for over a year now. I was not sure if I was going to keep the car but now I definitely am. 1. 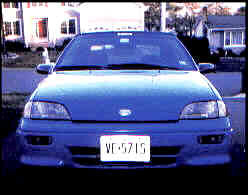 86K miles on the clock, competition blue exterior, gray interior with blue piping. 2. 5 speed, new clutch, black leather Momo brand stick shift knob. 3. Jensen front speakers, Blaukpunkt rear speakers. 4. 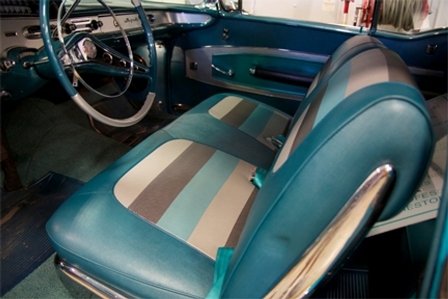 Custom solo rear seat installed by previous owner. It's a boat seat and a seat belt has been installed. Used for his grandson, now my for kids. 5. Progressive alloy rims with Cooper Sportmaster GLT tires, size 175/70R13. 6. Platinum plugs (soon to be Denso Iridium plugs), quality wires, new cap, rotor, new K&N Air Filter, Mobil 1 oil, Purolator Pure One oil filter, new fuel filter. 7. 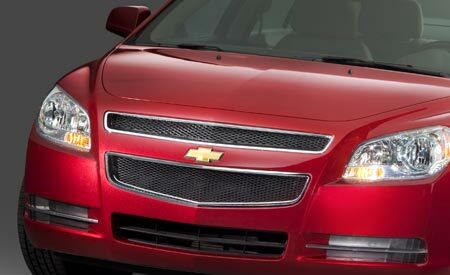 Brand new Gabriel VST Gas Charged struts with new polyurethane strut mounts. 8. Brand new exhaust system, 2" system from exhaust header to tailpipe, re-used the OEM cat, installed a new Dynomax Super Turbo muffler. Port matched the exhaust manifold to the engine exhaust ports. 9. New belts & timing belt. 11. Am/FM stereo cassette, also have the Sony portable car CD hooked up - plugs into the lighter and has a cassette that connects the car stereo to the CD player so I can play CD's through the cars stereo system. The car runs great, has good power and pull throughout the RPM ranges, especially up high from 4-6K RPM's. At this point she needs nothing. In the future, I'll look in to more sports oriented tires (perhaps Cooper Cobra's or Firestone Firehawk SS-20's) when the tires wear out, (which probably isn't anytime soon!) and brake mods (drilled rotors, high performance pads (again, won't be needing brakes anytime soon!). The car is a lot of fun to drive, sounds good, is great in the summer since I live only 5-10 minutes from the beach, and gets 40+ mpg's.